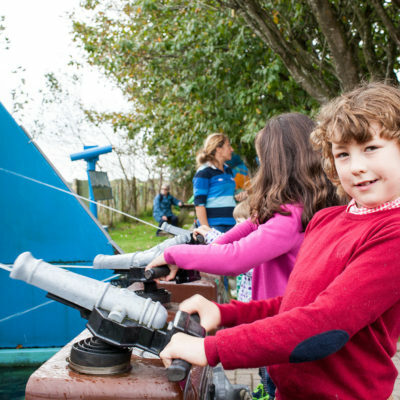 Anglesey Sea Zoo aims to provide a fun and educational experience for groups, schools and individuals of all ages, within a family friendly atmosphere. All the marine animals in our care are native British species, of which you will discover over 60. These can be found all around Britain from the warmer southern waters of areas such as Cornwall to the cold refreshing waters of Northern Scotland. As you wander around you will find information not only for all the animals, but also on important topics such as marine litter and invasive species. We believe in providing value for money to all our guests, and aim to offer as much variety as possible to people of all ages that visit the Anglesey Sea Zoo. We recommend that visitors allow themselves several hours to see everything on site. To enquire about making a booking, please call 01248 430 411 or email sarah@angleseyseazoo.co.uk. Our staff will get back to you to confirm your booking details. Click here for group prices. The marine biological staff at the Anglesey Sea Zoo are experienced educators, and are able to offer a rewarding, informative, and above all enjoyable experience for all ages and levels from nursery to university. We can provide everything you might need whilst here from simple worksheets to full guided tours, as well as seashore safaris and interactive talks and lectures from our marine biologists. For more information on packages, click here. A visit to Anglesey Sea Zoo offers an opportunity to learn about and expand on topics related to marine biology, ecology and conservation - or even art or maths! Click here for more topics to study during your visit. Did you know we have downloadable workbooks you can use during your visit? Worksheets are available for ages 5-7 (KS1), 7-9 (Lower KS2), 9-11 (Upper KS2) and 11-12 (Year 7.) Print them out for your class to make your visit even more educational! Click here to download worksheets. Below is a summary of just some of the more practical things onsite to make your visit more enjoyable… For more information, click here. Toilets located at the beginning of the aquarium by the main entrance, and in the shop at the end of the aquarium. There is also a disabled toilet located just outside the main entrance. A wheelchair (which can be booked in advance) can be provided on free loan; all areas of the aquarium are wheelchair accessible. Post-box on site that is emptied twice a day. Adventure playground and bouncy castle. (Height restrictions apply - bouncy castle maximum height limit 120cm). In addition to the Sea Zoo’s Rockpool Café, which offers tasty snacks and drinks, there are also several outdoor areas to choose between if you bring a picnic. These are both uncovered and covered areas. A fully stocked gift shop with something for all tastes and price ranges. Coin-operated games such as crocodile boats and pirate water blaster. Most of the facilities are available free of charge to every visitor to the Anglesey Sea Zoo without advance booking. The Anglesey Sea Zoo's staff place great emphasis on customer care. In return all that we ask is for groups to arrive punctually (or to try to let us know if you can't), with well behaved children who will respect their surroundings and the living creatures they'll encounter.